A top tip for cyclists from Nigel Jones: Don't buy cheap tools! The larger chain link splitter on the left of the picture cost me about eight pounds. The smaller one on he right cost about three pounds. But believe it or not the £8 tool is cheaper. I have thrown away many chain splitters just like the £3 item. Usually because the pin is soft and either bends or mushrooms over after a couple of chains. So if you are a regular cyclist likely to replace more than about 6 chains spend the extra money its good economics. I initially bought the cheaper items because they were all that my local bicycle shops stocked. But every time that I needed a new one (usually in a hurry) I complained about a how crap the £3 splitters were and eventually got one of the larger £8 items. Believe it or not the reason that bike shops frequently stock cheap crappy tools, is because your average cyclist is too mean to spend the extra for a quality item. The central pin is much harder and after changing several chains with it there is absolutely no sign of damage to the pin. Also the end of the pin is rounded over slightly and this tends to help the pin to guide through the hole in the chains side plate. The threaded length is longer reducing wobble and helping the pin to push straighter. But best of all you get lots of extra leverage when you turn the handles making the job very easy, instead of a pain in the a**e, thumbs and fingers. 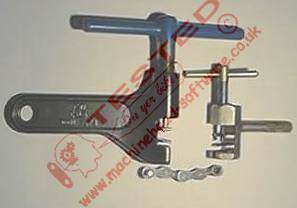 The shorter levers on the smaller chain splitter, don't give much leverage, you can do the job for sure but you need strong fingers and that little tommy bar really cuts into the finger and thumb. The small chain splitter in the photo has 'Cyclo' on the side and I'm rather embarrassed to admit that Cyclo are a British company. It has done one chain (with difficulty) and the end of the pin is showing minor damage (difficult to photograph). I could probably use it for another chain but this isn't likely. I can't be sure that chain link splitters, that I broke previously were also made by Cyclo because they were thrown away years ago, but they looked just like this one. The larger chain splitter was made by Park Tools. It's a quality item. There are other manufacturers of quality bike mechanics tools, but I can't recommend their chain splitters because these are the only ones I have tested. The (avoid) cheap tools principle applies to a great many other items - cheap bicycle pumps spring to mind as another classic example. Splitting the chain is a straightforward procedure. Place the chain in the splitter as shown in the photo on the left. Then turn the tommy bar (top) clockwise to push the pin out of the chain. Don't push it all the way through though - If the chain pin is retained by the lower chain side plate it is much easer to reverse the procedure to push the pin back in. If after re-joining the two ends of chain the link is stiff, just put it back into the splitter the other way up and push the pin back very slightly. Sorry the photo is a bit naff. I was holding the chain link extractor in one hand and my camera in the other.